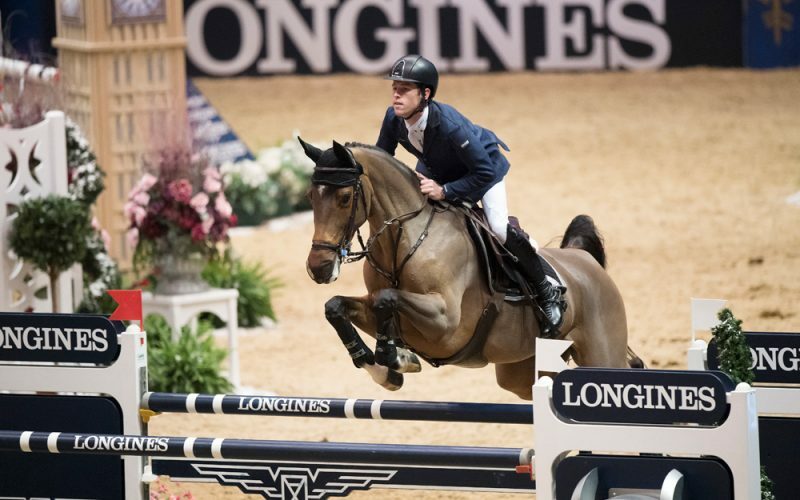 Scott Brash became the 15th British rider to come out on top in his home leg of the FEI World Cup™ Jumping series when galloping to victory with Hello M’Lady in the Longines qualifier at Olympia in London (GBR) this evening. 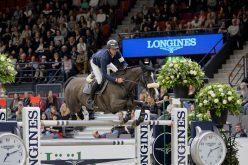 This was the eighth round of the 2016/2017 Western European League, and today’s result leaves the 31-year-old rider only a few points short of a qualifying spot for the eagerly-anticipated Longines Final in Omaha, Nebraska (USA) next March. 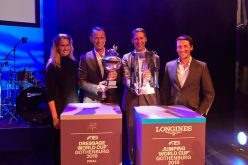 The host-nation runners were in flying form, with Brash’s London 2012 Olympic gold-medal-winning team-mate, 33-year-old Ben Maher, finishing a close second with Diva while young Belgian talent, 23-year-old Nicola Philippaerts slotted into third with H&M Harley vd Bisschop. It was a frustrating result for Maher, who was also runner-up in the same event last year. “I wanted to win, but if I was going to be beaten by anyone I was hoping it would be Scott!” he said. There were 13 into the jump-off, and it was Sweden’s Malin Baryard-Johnsson who set the pace with H&M Cue Channa who hit only the very last. Seventh to go, Maher produced the first clear in 38.85 seconds before America’s Laura Kraut and Zeremonie and John Whitaker and Ornellaia followed with foot-perfect runs but couldn’t catch him. Philippaerts, whose famous father Ludo won this prestigious competition with the legendary Darco 27 years ago, came close when breaking the beam in 39.07 seconds, but it was Brash who demoted his fellow-countryman when second-last to go. “Ben was very fast back to the double, and it was on a blind turn which was tricky for the horses, so we had to be quick to beat him!” Brash said, after galloping home in 38.73 seconds. 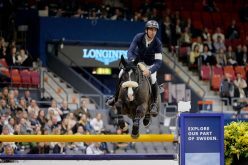 And when it fell apart for Germany’s Marcus Ehning and his Madrid-leg winner Comme Il Faut who were last to go, it was an all-British one-two. “It’s very special to win in front of the home crowd, they were really behind us and it gives you that extra edge!” said Brash who now has the series Final in his sights. “I’ve never really targeted it in the past because the calendar is so full and there’s often a championship, but I’m very fortunate to have a strong team, all coming back from injury, including Hello Sanctos”, he added. 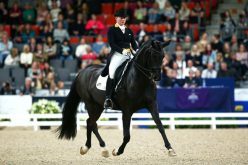 Result: 1, Hello M’Lady (Scott Brash) GBR 0/0 38.73; 2, Diva ll (Ben Maher) GBR 0/0 38.85; 3, H&M Harley vd Bisschop (Nicola Philippaerts) BEL 0/39.07; 4, Zeremonia (Laura Kraut) USA 0/0 39.63; 5, Ornellaia (John Whitaker) GBR 0/0 39.70; 6, Limestone Grey (Lorenzo de Luca) ITA 0/4 39.10; 7, H&M Cue Channa (Malin Baryard-Johnsson) SWE 0/4 41.17; 8, Quenelle du Py (Olivier Robert) FRA 0/4 41.57; 9. Equita van T Zorgvliet (Daniel Deusser) GER 0/8 41.21; 10, Casallo Z (Piergiorgio Bucci) ITA 0/8 41.59; 11, California (Edwina Tops-Alexander) AUS 0/8 43.97; 12, Chacco’s Son (Maurice Tebbel) GER 0/8 44.27. 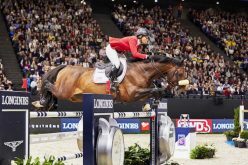 The Grand Hall at Olympia in London (GBR) staged the eighth leg of the Longines FEI World Cup™ Jumping 2016/2017 Western European League today. 35 riders from 14 nations lined out, including 5 of the top 10. 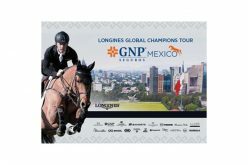 13 riders from 7 nations qualified for the second-round jump-off against the clock. Course designer was Great Britain’s Kelvin Bywater. 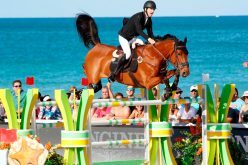 British riders filled three of the top five places, with Scott Brash (Hello M’Lady) and Ben Maher (Diva) finishing first and second respectively. 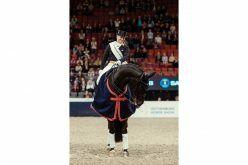 Brash is the 15th British winner of the FEI World Cup™ Jumping qualifier in Great Britain. 13 fences in first round and time allowed of 64 seconds. 5 horse-and-rider combinations jumped double-clear. French rider Kevin Staut continues to head the Western European League table after today’s competition. The next leg of the series takes place at Mechelen, Belgium on Friday 30 December. The Longines FEI World Cup™ Jumping 2016/2017 Final will take place in Omaha, Nebraska (USA) from 27 March to 2 April 2017.